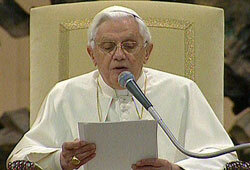 General audience, Benedict XVI illustrates the moments of this "time of conversion” and practices connected with it. Linked "strictly" to fasting, almsgiving is the will to do good. Both are the "two wings of a prayer, which allow us to take flight and seek the things of heaven." Vatican City (AsiaNews) - Lent, which begins today, Ash Wednesday, "reminds us of our condition as creatures, invites us to repentance, to a journey of conversion," it is a "journey of conversion", also characterized by the practice of fasting , almsgiving and prayer. Fasting, in particular, means abstinence from food but includes other forms of deprivation for a more sober life", but this “is the outward sign of an inner reality, of our efforts, with the help of God, to abstain from evil and to live the Gospel. 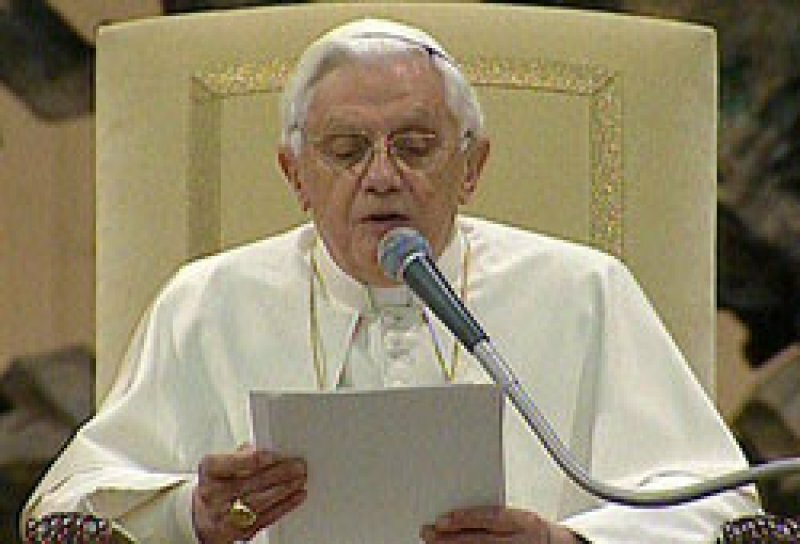 Those who do not nourish themselves with the Word of God, are not really fasting"
The sense and the "moments" of Lent, " reminds us that Christian life is a “road” to be travelled, it consists not so much of a law to be observed, but in meeting, welcoming and following Christ" were presented today by Benedict XVI IN his address to the seven thousand people in the Vatican for the general audience. This time, in the words of the Pope, "is following the school of Jesus, to retrace the events that have brought us salvation, but not as a simple commemoration, a remembrance of past events. In liturgical celebrations, Christ is made present through the Holy Spirit, those saving events become current. There is a keyword that occurs frequently in the liturgy to indicate this: the word today, and it must be understood not in the metaphorical sense but in the original and real sense. Today, God reveals His law and has given us to choose today between good and evil, between life and death, today the Kingdom of God is near. Repent and believe the Gospel; today, Christ died on Calvary and rose from the dead and ascended into heaven and is seated at the Father's right, today we are given the Holy Spirit, today is the opportune time. Participating in the Liturgy, then, means immersing our lives in the mystery of Christ, his permanent presence, to follow a path in which we enter into His death and resurrection to have life. " On the Sundays of Lent, Benedict XVI said we are invited to live a baptismal journey, "to revive in us this gift and make it so that we discover in our lives the needs and commitments of this sacrament, which is the basis of our Christian life ", as pointed out, he said, in his message for Lent this year. "The Church has always associated the Easter Vigil with the celebration of baptism: it realizes the great mystery through which man, who died to sin, is given a share of new life in the Risen Christ and receives the Spirit of God who raised Jesus from the dead. " "The readings we will hear in the next few Sundays, and to which I invite you to pay special attention, are taken from ancient tradition, which accompanied the catechumens in the discovery of Baptism: they are the good news of what God does is in this Sacrament, a stunning baptismal catechesis addressed to each of us. The first Sunday, presents the temptations of Jesus in the desert, it invites us to renew our final decision for God and to courageously face the fight ahead to remain faithful. " The second Sunday "is said of Abraham and the Transfiguration. Baptism is the sacrament of faith and of divine sonship, like Abraham, the father of believers, we too are invited to leave, to go out from our land, to leave the security we have built, to put our trust in God, and the goal can be seen in the transfiguration of Christ, the beloved Son, in whom we become children of God. " The following Sunday baptism is presented through the images of water, light and life. In the Third, we meet the Samaritan woman. Like Israel in the Exodus, in Baptism we too received the water that saves. Jesus, as He tells the Samaritan woman, has the water of life which satisfies every thirst; this water is His Spirit"
The fourth Sunday leads us to reflect on the experience of the man 'blind from birth'. In Baptism we are freed from the shades of evil and receive the light of Christ in order to live as children of light. ... Finally, the fifth Sunday presents us with the raising of Lazarus. In Baptism we pass from death to life and become capable of pleasing God, of causing the old man to die so as to live in the spirit of the Risen One”. This itinerary is characterized, in Church tradition by certain practices: fasting, almsgiving and prayer. Fasting is "strictly" linked to charity. Citing St. Leo the Great, the Pope said that alms, "under the single name of 'mercy' embraces many good works. A vast field of works of mercy. Not only the rich and the wealthy can benefit others through charity, but even those of modest and poor means. Thus, unequal in fortune, they can all be equal in sentiments of piety of the soul. " "Lent is also a special time for prayer. St. Augustine calls fasting and almsgiving the “wings of prayer”, since they prepare our hearts to take flight and seek the things of heaven, where Christ has prepared a place for us" " The Church knows that, because of our weakness, it is often difficult to be silent before God and be fully aware of our condition as creatures who depend on Him, as sinners who are in need of His love. This is why Lent invites us to a more faithful and intense prayer"
"In this journey of Lent – concludes the Pope - we are ready to understand the call of Christ to follow a more determined and consistent path, renewing our commitments and grace of our baptism, to abandon the old man within us and vest ourselves in Christ, to arrive at Easter renewed so we can say together with Saint Paul "it is no longer I who live but Christ who lives in me." Pope: Lent,"an occasion to make our hope more vibrant and firm"
Pope: "I pray for reconciliation, peace, and justice in the Middle East"